The homes or shelters of the Nēhiyaw (Cree), Blackfoot, Blood, Peigan, Assiniboine, Stoney and Métis were known as Tipis and constructed using the long straight trunks of Lodge Pole Pines found in the Northern Boreal forests. The Nēhiyaw (Cree), Blackfoot, Blood, Peigan, Assiniboine, Stoney and Métis were nomadic people who travelled across the great plains of Canada. They followed the buffalo, their main food source, to hunt animals for food, skins and furs, as well as, gather medicinal plants, berries, roots and grains. Their homes or shelters were known as Tipi; the coverings were made from buffalo skins and were sometimes decorated using dyes made from plants, animal blood or ground up minerals made into paint. Students decorate their own scale replica tipi covering using traditional symbols of land, plants and animals on recycled canvas or vinyl. 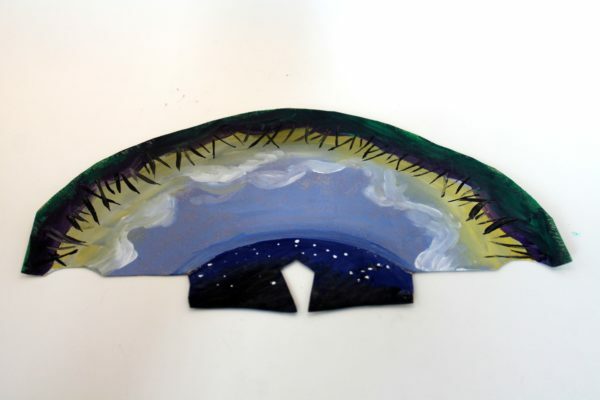 Take this art project back to school to display, or students may choose to form their very own 3D replica model of a tipi using their embellished covering. Teachers can later challenge their students to construct a village of personal tipis in the classroom using recycled and reused objects. Science: Plant parts and their function, forests and trees, night sky. Math: pattern, repetition, and symmetry.